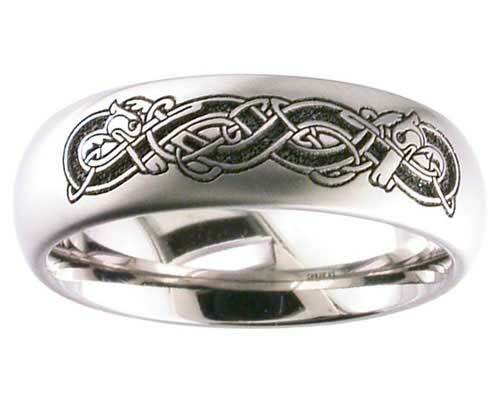 Celtic Welsh Or Irish Dog Titanium Ring : LOVE2HAVE in the UK! A domed profile titanium ring that has a Celtic engraving of a dog repeated twice on its outer. The dog in Celtic times signified courage and loyalty. Royalty and Warriors would take their dogs or hounds as gifts of honour for hunting. There are many tales in ancient legends of both Welsh and Irish hounds, the most famous being that of Prince Llewellyn and his dog named Gelert. The designer has advised us that the engraving for this ring takes an hour to complete. The engraved surface itself is quite textured, therefore adding to the ancient Celtic symbolism depicted. The ring's width is 7mm, and as mentioned above, it is available in a satin or polished finish.